Not to be confused with ephedrone. Common side effects include trouble sleeping, anxiety, headache, hallucinations, high blood pressure, fast heart rate, loss of appetite, and inability to urinate. Serious side effects include stroke, heart attack, and abuse. While likely safe in pregnancy, its use in this population is poorly studied. Use during breastfeeding is not recommended. Ephedrine works by increasing the activity of the α and β adrenergic receptors. 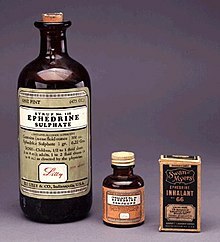 Ephedrine was first isolated in 1885 and came into commercial use in 1926. It is on the World Health Organization's List of Essential Medicines, the most effective and safe medicines needed in a health system. It is available as a generic medication. The wholesale cost in the developing world is about US$0.69–1.35 per dose. In the United States it is not very expensive. It can normally be found in plants of the Ephedra type. Dietary supplements containing ephedrine are illegal in the United States, with the exception of those used in traditional Chinese medicine, where its presence is noted by má huáng. As a phenethylamine, ephedrine has a similar chemical structure to amphetamines and is a methamphetamine analogue having the methamphetamine structure with a hydroxyl group at the β position. Because of ephedrine's structural similarity to methamphetamine, it can be used to create methamphetamine using chemical reduction in which ephedrine's hydroxyl group is removed; this has made ephedrine a highly sought-after chemical precursor in the illicit manufacture of methamphetamine. The most popular method for reducing ephedrine to methamphetamine is similar to the Birch reduction, in that it uses anhydrous ammonia and lithium metal in the reaction. The second-most popular method uses red phosphorus and iodine in the reaction with ephedrine. Moreover, ephedrine can be synthesized into methcathinone via simple oxidation. As such, ephedrine is listed as a table-I precursor under the United Nations Convention Against Illicit Traffic in Narcotic Drugs and Psychotropic Substances. Ephedrine may be quantified in blood, plasma, or urine to monitor possible abuse by athletes, confirm a diagnosis of poisoning, or assist in a medicolegal death investigation. Many commercial immunoassay screening tests directed at the amphetamines cross-react appreciably with ephedrine, but chromatographic techniques can easily distinguish ephedrine from other phenethylamine derivatives. Blood or plasma ephedrine concentrations are typically in the 20-200 µg/l range in persons taking the drug therapeutically, 300-3000 µg/l in abusers or poisoned patients and 3–20 mg/l in cases of acute fatal overdosage. The current WADA limit for ephedrine in an athlete's urine is 10 µg/ml. Bupropion is an example of an antidepressant with an amphetamine-like structure similar to ephedrine, and it is an NDRI. Its action bears more resemblance to amphetamine than to fluoxetine in that its primary mode of therapeutic action involves norepinephrine and to a lesser degree dopamine, but it also releases some serotonin from presynaptic clefts. It should not be used with ephedrine, as it may increase the likelihood of side effects. Ephedrine should be used with caution in patients with inadequate fluid replacement, impaired adrenal function, hypoxia, hypercapnia, acidosis, hypertension, hyperthyroidism, prostatic hypertrophy, diabetes mellitus, cardiovascular disease, during delivery if maternal blood pressure is >130/80 mmHg, and during lactation. Contraindications for the use of ephedrine include: closed-angle glaucoma, phaeochromocytoma, asymmetric septal hypertrophy (idiopathic hypertrophic subaortic stenosis), concomitant or recent (previous 14 days) monoamine oxidase inhibitor (MAOI) therapy, general anaesthesia with halogenated hydrocarbons (particularly halothane), tachyarrhythmias or ventricular fibrillation, or hypersensitivity to ephedrine or other stimulants. While ephedrine is a potentially dangerous natural compound; as of 2004[update] the US Food and Drug Administration had received over 18,000 reports of adverse effects in people using it. In saquinavir synthesis, the half-acid is resolved as its salt with l-ephedrine. In the outdated D/L system (+)-ephedrine is also referred to as L-ephedrine and (−)-ephedrine as D-ephedrine (in which case, in the Fisher projection, the phenyl ring is drawn at the bottom). Often, the D/L system (with small caps) and the d/l system (with lower-case) are confused. The result is that the levorotary l-ephedrine is wrongly named L-ephedrine and the dextrorotary d-pseudoephedrine (the diastereomer) wrongly D-pseudoephedrine. The IUPAC names of the two enantiomers are (1R,2S)- respectively (1S,2R)-2-methylamino-1-phenylpropan-1-ol. A synonym is erythro-ephedrine. Proposed biosynthetic pathway of ephedrine from L-phenylalanine and pyruvic acid. Ephedrine is obtained from the plant Ephedra sinica and other members of the genus Ephedra. Raw materials for the manufacture of ephedrine and traditional Chinese medicines are produced in China on a large scale. As of 2007, companies produced for export US$13 million worth of ephedrine from 30,000 tons of ephedra annually, or about ten times the amount used in traditional Chinese medicine. Ephedrine was long thought to come from modifying the amino acid L-phenylalanine. L-Phenylalanine would be decarboxylated and subsequently attacked with ω-aminoacetophenone. Methylation of this product would then produce ephedrine. This pathway has since been disproven. A new pathway proposed suggests that phenylalanine first forms cinnamoyl-CoA via the enzymes phenylalanine ammonia-lyase and acyl CoA ligase. The cinnamoyl-CoA is then reacted with a hydratase to attach the alcohol functional group. The product is then reacted with a retro-aldolase, forming benzaldehyde. Benzaldehyde reacts with pyruvic acid to attach a 2 carbon unit. This product then undergoes transamination and methylation to form ephedrine and its stereoisomer, pseudoephedrine. Ephedrine in its natural form, known as má huáng (麻黄) in traditional Chinese medicine, has been documented in China since the Han dynasty (206 BC – 220 AD) as an antiasthmatic and stimulant. In 1885, the chemical synthesis of ephedrine was first accomplished by Japanese organic chemist Nagai Nagayoshi based on his research on traditional Japanese and Chinese herbal medicines. The industrial manufacture of ephedrine in China began in the 1920s, when Merck began marketing and selling the drug as ephetonin. Ephedrine exports from China to the West grew from 4 to 216 tonnes between 1926 and 1928. In traditional Chinese medicine, má huáng has been used as a treatment for asthma and bronchitis for centuries. In January 2002, Health Canada issued a voluntary recall of all ephedrine products containing more than 8 mg per dose, all combinations of ephedrine with other stimulants such as caffeine, and all ephedrine products marketed for weight-loss or bodybuilding indications, citing a serious risk to health. Ephedrine is still sold as an oral nasal decongestant in 8 mg pills, OTC. In 1997, the FDA proposed a regulation on ephedra (the herb from which ephedrine is obtained), which limited an ephedra dose to 8 mg (of active ephedrine) with no more than 24 mg per day. This proposed rule was withdrawn, in part, in 2000 because of "concerns regarding the agency's basis for proposing a certain dietary ingredient level and a duration of use limit for these products." In 2004, the FDA created a ban on ephedrine alkaloids marketed for reasons other than asthma, colds, allergies, other disease, or traditional Asian use. On April 14, 2005, the U.S. District Court for the District of Utah ruled the FDA did not have proper evidence that low dosages of ephedrine alkaloids are actually unsafe, but on August 17, 2006, the U.S. Court of Appeals for the Tenth Circuit in Denver upheld the FDA's final rule declaring all dietary supplements containing ephedrine alkaloids adulterated, and therefore illegal for marketing in the United States. Furthermore, ephedrine is banned by the NCAA, MLB, NFL, and PGA. Ephedrine is, however, still legal in many applications outside of dietary supplements. Purchasing is currently limited and monitored, with specifics varying from state to state. The law gives similar regulations to mail-order purchases, except the monthly sales limit is only 7.5 g.
As a pure herb or tea, má huáng, containing ephedrine, is still sold legally in the USA. The law restricts/prohibits its being sold as a dietary supplement (pill) or as an ingredient/additive to other products, like diet pills. All Ephedra spp and ephedrine itself are considered schedule 4 substances under the Poisons Standard (October 2015). A schedule 4 drug is considered a Prescription Only Medicine, or Prescription Animal Remedy – Substances, the use or supply of which should be by or on the order of persons permitted by State or Territory legislation to prescribe and should be available from a pharmacist on prescription under the Poisons Standard (October 2015). In South Africa, ephedrine was moved to schedule 6 on 27 May 2008, which makes it illegal to have ephedrine in higher doses than 8 mg per pill. Lower than 8 mg pills are still available Otc for sinus, head colds and flu, but is completely illegal in over the counter weight loss products. Ephedrine was freely available in pharmacies in Germany until 2001. Afterwards, access was restricted since it was mostly bought for unindicated uses. Similarly, ephedra can only be bought with a prescription. Since April 2006, all products, including plant parts, that contain ephedrine are only available with a prescription. ^ Briggs, Gerald G.; Freeman, Roger K.; Yaffe, Sumner J. (2011). Drugs in pregnancy and lactation : a reference guide to fetal and neonatal risk (9th ed.). Philadelphia: Lippincott Williams & Wilkins. p. 495. ISBN 9781608317080. Archived from the original on 2017-09-08. ^ a b "Ephedrine Pregnancy and Breastfeeding Warnings". Archived from the original on 8 September 2017. Retrieved 27 January 2016. ^ Debasis Bagchi; Harry G. Preuss, eds. (2013). Obesity epidemiology, pathophysiology, and prevention (2nd ed.). Boca Raton, Florida: CRC Press. p. 692. ISBN 9781439854266. Archived from the original on 2017-09-08. ^ Hamilton, Richart (2015). Tarascon pocket pharmacopoeia 2015 (deluxe lab-coat ed.). Jones & Bartlett Learning. p. 162. ISBN 9781284057560. ^ a b Drew; et al. (1978). "Comparison of the effects of D-(-)-ephedrine and L-(+)-pseudoephedrine on the cardiovascular and respiratory systems in man". Br J Clin Pharmacol. 6 (3): 221–225. doi:10.1111/j.1365-2125.1978.tb04588.x. PMC 1429447. PMID 687500. ^ Buckey Jr, Jay C. (2006). Space Physiology. Oxford University Press. p. 201. ISBN 978-0-1997-4790-0. ^ Sanford, Christopher A.; Jong, Elaine C. (2008). The Travel and Tropical Medicine Manual E-Book. Elsevier Health Sciences. p. 139. ISBN 978-1437710694. ^ Shekelle, P. G.; Hardy, M.L. ; Morton, S. C.; Maglione, M.; Mojica, W. A.; Suttorp, M.J.; Rhodes, S.L. ; Jungvig, L.; Gagné, J. (2003). "Efficacy and Safety of Ephedra and Ephedrine for Weight Loss and Athletic Performance: A Meta-analysis". JAMA: The Journal of the American Medical Association. 289 (12): 1537–1545. doi:10.1001/jama.289.12.1537. PMID 12672771. ^ Dwyer, J.T. ; Allison, D. B.; Coates, P.M. (2005). "Dietary Supplements in Weight Reduction". Journal of the American Dietetic Association. 105 (5): S80–S86. doi:10.1016/j.jada.2005.02.028. PMID 15867902. ^ George A. Bray; Claude Bouchard (2004). Handbook of obesity. CRC Press. pp. 494–496. ISBN 978-0-8247-4773-2. Archived from the original on 2014-06-26. ^ Magkos, F.; Kavouras, S.A. (2004). "Caffeine and ephedrine: Physiological, metabolic and performance-enhancing effects". Sports Medicine. 34 (13): 871–889. doi:10.2165/00007256-200434130-00002. PMID 15487903. ^ Schier, JG; Traub, SJ; Hoffman, RS; Nelson, LS (2003). "Ephedrine-induced cardiac ischemia: exposure confirmed with a serum level". Clin. Toxicol. 41 (6): 849–853. doi:10.1081/clt-120025350. ^ R. Baselt, Disposition of Toxic Drugs and Chemicals in Man, 8th edition, Biomedical Publications, Foster City, CA, 2008, pp. 542-544. ^ Palamar J (January 2011). "How ephedrine escaped regulation in the United States: a historical review of misuse and associated policy". Health Policy (Review). 99 (1): 1–9. doi:10.1016/j.healthpol.2010.07.007. PMID 20685002. ^ Borsato, Giuseppe; Linden, Anthony; De Lucchi, Ottorino; Lucchini, Vittorio; Wolstenholme, David; Zambon, Alfonso (2007). "Chiral Polycyclic Ketones via Desymmetrization of Dihaloolefins". J. Org. Chem. 72 (11): 4272–4275. doi:10.1021/jo070222g. ^ Abourashed, Ehab A; El-Alfy, Abir T; Khan, Ikhlas A; Walker, Larry (2003). "Ephedra in perspective–a current review". Phytotherapy Research. 17 (7): 703–12. doi:10.1002/ptr.1337. PMID 12916063. ^ Patil, Popat N.; Tye, A.; LaPidus, J.B. (1965). "A pharmacological study of the ephedrine isomers" (PDF). JPET. 148 (2): 158–168. ^ a b Hertweck, Christian (October 1, 2001). "A Mechanism of Benzoic Acid Biosynthesis in Plants and Bacteria that Mirrors Fatty Acid β-Oxidation". ChemBioChem. 2 (10): 784–6. doi:10.1002/1439-7633(20011001)2:10<784::AID-CBIC784>3.0.CO;2-K. PMID 11948863. ^ a b Grue-Sorensen, Gunnar; Spenser, Ian D. (May 1, 1988). "Biosynthesis of ephedrine". Journal of the American Chemical Society. 110 (11): 3714–3715. doi:10.1021/ja00219a086. ISSN 0002-7863. ^ Chen Long (Jan 15, 2007). "Chinese medicine's great waste of resources". Archived from the original on May 30, 2016. Retrieved May 9, 2016. ^ "Chemically Synthesized Ephedrine Put into Mass Production in China". November 5, 2001. Archived from the original on June 29, 2011. ^ a b Yamasaki, Kazuo; Tamaki, Taro; Uzawa, Sumiko; Sankawa, Ushio; Shibata, Shoji (1973). "Participation of C6-C1 unit in the biosynthesis of ephedrine in Ephedra". Phytochemistry. 12 (12): 2877–2882. doi:10.1016/0031-9422(73)80499-6. Retrieved 2015-06-10. ^ Shigeaki Kobayashi, et al. The Sympathomimetic Actions of l-Ephedrine and d-Pseudoephedrine: Direct Receptor Activation or Norepinephrine Release? Archived 2008-11-22 at the Wayback Machine Anesth Analg 2003; 97, pp.1239-1245. ^ Munhall, AC; Johnson, SW (2006). "Dopamine-mediated actions of ephedrine in the rat substantia nigra". Brain Res. 1069 (1): 96–103. doi:10.1016/j.brainres.2005.11.044. PMID 16386715. ^ Frank Dikotter; Lars Peter Laamann (16 April 2004). Narcotic Culture: A History of Drugs in China. University of Chicago Press. p. 199. ISBN 978-0-226-14905-9. ^ "Health Canada requests recall of certain products containing Ephedra/ephedrine". Health Canada. January 9, 2002. Archived from the original on February 6, 2007. Retrieved July 7, 2009. ^ Laccourreye, O.; Werner, A.; Giroud, J.-P.; Couloigner, V.; Bonfils, P.; Bondon-Guitton, E. (2015). "Benefits, limits and danger of ephedrine and pseudoephedrine as nasal decongestants". European Annals of Otorhinolaryngology, Head and Neck Diseases. 132 (1): 31–34. doi:10.1016/j.anorl.2014.11.001. ISSN 1879-7296. ^ "Archived copy (pdf)" (PDF). Archived from the original (PDF) on 2011-07-10. Retrieved 2010-07-01. ^ Verordnung zur Neuordnung der Verschreibungspflicht von Arzneimitteln (AMVVNV). Archived 2014-05-17 at the Wayback Machine V. v. 21. Dezember 2005 BGBl. I S. 3632; Geltung ab 1. Januar 2006. Wikimedia Commons has media related to Ephedrine.